Today we celebrate the solemnity of the Assumption/Dormition of Mary. This is an ancient celebration documented as occurring as early as the 400’s, probably soon after the Council of Ephesus in 431 declared Mary the Theotokos: the Mother of God. In a homily on the solemnity of the Assumption, Pope John Paul II used John 14:3 as a Scriptural foundation for understanding the dogma of the Assumption of Mary. In those verses Jesus tells his disciples at the Last Supper, “If I go and prepare a place for you, I will come again, and will receive you to myself; that where I am, you may be there also.” Our belief is that Mary’s rising to Heaven is the pledge of the fulfillment of Christ’s promise to His disciples: “…where I am, you will be also.” Mary, as our spiritual Mother, through Christ’s promise beckons us to follow her. With this celebration comes the renewal of the truth that Mary not only belonged to Christ as His Blessed Mother, but that she was truly raised on high as our Queen of Heaven. Beautiful Mary, is in her simplicity, the true sign that informs the world of the humility, love, and mercy of her Messiah Son. Today we acknowledge Mary as a Queen, who takes her place in the throne room of God, not to have power over us, but, rather, to intercede for us as the perfect mother and faith-filled disciple. 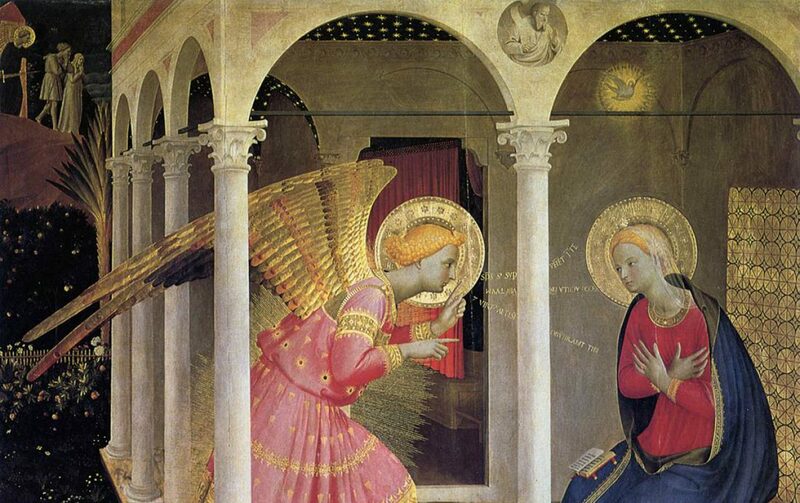 We witness this truth in this exquisite painting by Beato Fra Angelico completed in the year 1430. In the “fullness of time” after millennia of human history, the Father of Mercies saw in Mary a loving and lovable woman who possessed great courage. She is the person who in her simplicity and purity would be completely open, totally surrendering, and free from the pollution of pride or self-will. She was the woman who would be the New Eve, the mother of the living, the mother of a new creation. It is through our own rebirth, through water and the Spirit, that we are able to bear fruit and imitate Mary in bringing the newborn Christ to others. St. Maximus the Confessor speaks of this when he says “Every soul that believes, conceives and gives birth to the Word of God according to faith. Christ is the fruit, and all of us, are mothers of the Christ.” (from Vladimir Zelinsky’s “Mary in the Mystery of the Church: The Orthodox Search for Unity” found in Mary CoRedmptrix, Mediatrix, Advocate – Theological Foundations II. M.I. Miravalle, S.T.D., editor). Our Blessed Mother’s words in her beautiful Canticle, and her personal destiny, are inseparably linked to our own – for she is one of us; and by keeping our focus on her Son, we too, through the grace of God, will experience His mercy which lasts from age to age on those who fear Him. In these very troubled times may Our Lady of the Assumption always keep us close to her heart. (Additional sources: 1 Corinthians 15: 20-27; Revelation, Chapters 12 and 19; Lumen Gentium, 59; and Pope Pius XII in his Munificentissimus Deus (November, 1950).